This has resulted in bankruptcy suits and social conflicts, Mr Ouko's reports on county governments say. "The huge amount of outstanding pending bills implies that the executive irregularly entered into commitments without approved budgets or funds budgeted for goods, works and services," Mr Ouko said. "The pending bills are as a result of non-adherence to the Government Financial Regulations and Procedures which provide that no expenditure for which there is no budgetary allocation may be incurred," the audit said. 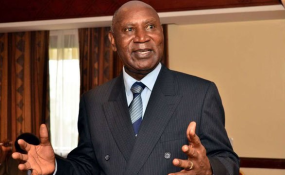 "No certificate of work done was made available for audit verification," Mr Ouko said.